OPI with the latest names and state-of-the-art formulas, it delivers the latest techniques combined with the finest nail products to achieve outstanding results for your nails. OPI is globally famous for creating high quality hand, feet and nail care products. Opi nail polishes and nail treatments are specially designed to protect and to put fashion into your fingers and toes. A collection of OPI best selling nail lacquers, a selection of shades from the colour spectrum, keeping up with fashion trends. Brights by OPI are a range of vivid, beautifully bright shades for fingers and toes, perfect for making a statement. Sheer and subtle shades of nail polish or shades that slightly tint your nails for a delicate barely there colour. High definition gel shine without the light. Your manicure will last up to 10 days. Just follow three easy steps for fast and easy application. Divided into colour groups so you can find your favourite shade of nail polish to suit your skin tone, style or outfit. Bursting with natural moisturisers and luscious aromas, a delight on your senses, packed with natural fruit extracts, vitamins and antioxidants. Mmanicure and pedicure products that help prevent breakdown of collagen and elastin resulting in younger looking hands and feet. Give the gift of great nails with Opi, from Mini boxed sets to limited edition seasonal collections. 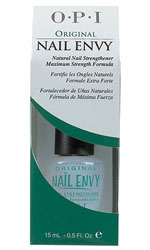 For weak and damaged nails, this maximum strength formula will give you harder, stronger and longer nails.